HARRISBURG – The House Transportation Committee held a hearing on Tuesday focused on attempting to reduce incidents of distracted driving. In Pennsylvania, 16,050 distracted driving crashes resulted in 69 fatalities in 2016. Part of the discussion was House Bill 1684, legislation sponsored by Rep. Rosemary M. Brown (R-Monroe/Pike) to prohibit calls on hand-held mobile telephones, except with the use of hands-free accessories, while operating a motor vehicle in Pennsylvania. Under Brown’s legislation, all motorists age 18 and older would be prohibited from using a hand-held phone while driving, but would be allowed to use hands-free devices. Additionally, drivers under the age of 18 would be prohibited from using both hand-held and hands-free devices. Exceptions for hand-held phone use would be permitted during emergency situations if the vehicle is not equipped with hands-free technology. The legislation would permit emergency responders, while conducting their official duties, to only use hand-held mobile telephones if their vehicles do not include hands-free service. The first offense for violating this law would be $50 and three points to a license and $150 for a second or each subsequent offense. The northeastern region of the United States – including New York, New Jersey, Connecticut, Maryland, Delaware, Vermont, New Hampshire and West Virginia – all ban hand-held cell phone use. Sixteen states in all ban hand-held cell phone use, including Georgia which also passed legislation this week. Eileen Woelkers Miller testified about her late son, Paul Miller Jr., who was killed in 2010 when a tractor-trailer veered across Route 33 in Monroe County and hit Miller’s car head-on. An investigation concluded the rig driver was reaching for his cell phone when the crash occurred. 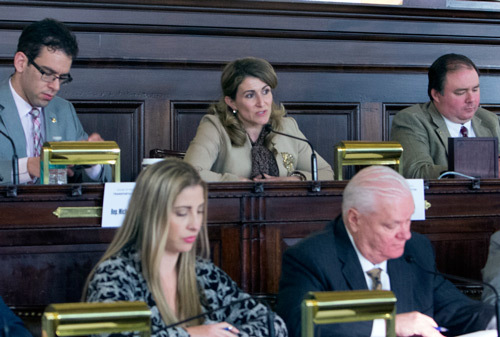 The committee also discussed House Bill 892, sponsored by Rep. Tom Murt (R-Montgomery/Philadelphia), which would create an additional summary offense for distracted driving if a driver is also found to be driving carelessly. The fine for distracted driving would be $50. This bill would also establish the Driver Distraction Awareness Fund. All fines would be deposited into that fund, and it would be used solely for the fund’s educational program. A wide variety of behaviors be considered distracted driving including using an electronic device, grooming device, food and drink, and printed material. Brown would like to remind constituents and their families that April is Distracted Driver Awareness Month, which is a good time to put down the phone and other distractions and practice safer driving. There is also a “Distracted Driving is Never OK” pledge, sponsored by AT&T, that can be taken by your family. Visit www.itcanwait.com for more details. For more information about House Bill 1684, or any state-related issue, contact Brown’s district office in East Stroudsburg located at 143 Seven Bridge Road, by calling 570-420-8301. Information can also be found on online at RepBrown.com or Facebook.com/RepRosemaryBrown.